The bite was like any other when a salmon strikes an anchovy or herring while trolling in a coastal bay. Tap, Tap. Slight pause. Rod buckles over. But seconds into the fight, the guy sitting in the front of my jet boat knew the salmon at the end of his line wasn’t an ordinary 25-pound Chetco salmon. It was much bigger. For 45 minutes, we chased a giant king around the Chetco estuary, from the Coast Guard station toward the Highway 101 bridge, back down toward the tips of the jetties, then back toward the harbor entrance, where I slid the net under a 58-pound king seven years ago today (Sept. 30, 2009), that once again started a big fish fever on the Chetco. For the next three months, the Chetco will be the focus of some of the best salmon fishing on the West Coast. It’s run of big kings, with fish over 50 pounds caught each year, draws anglers from throughout the country hoping to hook into a trophy fish. Salmon run in the Chetco, located next to the town of Brookings, Oregon, from late September through mid-December. Most of the fish are 4-year-old kings, which range from 20-30 pounds. Some years, 20 percent of the run, or one in five fish, is a five-year-old king, which top 40 pounds. A handful of giant six-year-old kings, those 50-plus-pounders, also return each fall. For the first month of the season, trolling is the most effective way to catch Chetco kings. Salmon move back and forth from the mouth of the river and the ocean as they acclimate to the fresh water. Late September and early to mid-October are the best times to troll the estuary, and when open, the ocean just off the mouth. In 2016, the ocean “bubble” season will be open Oct. 1-3 and 8-9. With customers, I generally troll plug-cut herring, but also put a whole anchovy on one or two of the rods. I like to use a Big Al’s Fish Flash ahead of the bait and troll with a spreader with 3-6 ounces of lead, depending on the tide and where I’m fishing. In fact, the massive 58-pounder was caught on an anchovy brined in a combination of Pautzke’s Nectar, rock salt, water and Fire Cure. Since that fish was caught, Pautzke has developed its own herring brine, Fire Brine, which essentially cures baitfish the same way. I use Blue and Chartreuse Fire Brine on this system. Once the rains come in October, bobber fishing becomes the main technique for Chetco kings. Salmon will move into the deeper pools throughout the lower river, from Tide Rock up to Second Bridge. Suspending a gob of roe combined with a live sand shrimp is the most effective way to catch these kings. 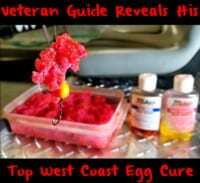 I cure my roe with half red and half pink Pautzke Fire Cure, with a little sugar and Natural BorX O Fire added to it during the curing process. While fishing, I place the eggs in a plastic container, smother them with Liquid Krill and add some sand shrimp. When bobber fishing, I use a wet egg that has only been dried for several minutes. When back-bouncing, I dry my eggs overnight. The wet eggs milk out quickly, but create a massive scent trail that draws the salmon to the bait. 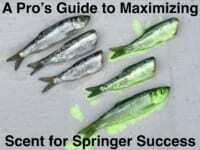 It is important to change baits frequently as the wet eggs are most effective for 10 minutes or two or three casts. While bobber fishing works well on the Chetco, running plugs also takes a lot of kings. The Chetco has dozens of prime plug runs. I like to use either the 4.5 or 5.0 MagLips with a sardine wrap. When the water gets low and clear, plugs still work on the Chetco, but first light is prime time for them. After that, bobber fishing eggs tend to work better. 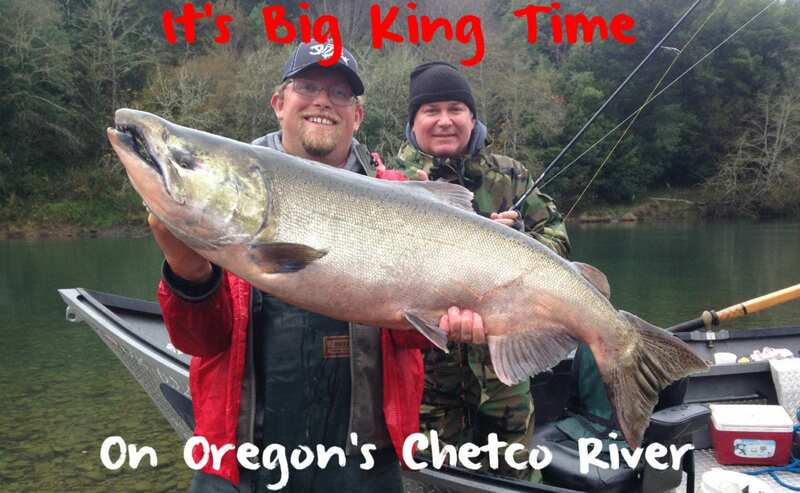 Regulations: One wild king a day can be kept on the Chetco as part of a two-fish limit. Hatchery fish tend to arrive early, from late September through mid-October. Editor’s Note: Guide Andy Martin of Wild Rivers Fishing (wildriversfishing.com) has gotten customers into several kings over 50 pounds on the Chetco. He is a longtime Pautzke pro staff member.